Whoooooooo lives in a pineapple under the sea? SpongeBob Squarepants! And in this exciting and hilarious Android game, you get a taste of what it’s like to work in the Krusty Krab franchise under the command of Mr. Krabs. There are familiar restaurants from the SpongeBob cartoon, including the Krusty Krab, Dutchman’s Inn, and others. 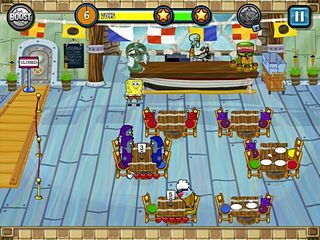 Serve the residents of Bikini Bottom by seating customers, taking orders, collecting tips, and growing the Krabby Patty Empire. The graphics will not disappoint. The game has a feeling to it that’s just like the cartoon. 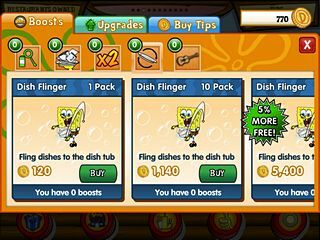 The SpongeBob franchise did not make a mistake by putting its name with this game. The game is free and you can use your in-game money to upgrade, or if you’d like, you can make purchases using real money. It’s all about the booty! There are seven free levels, but you can upgrade to get more levels and goofy restaurants. There are cool power-ups in the store for enhanced gameplay. There are familiar restaurants from the SpongeBob cartoon, including the Krusty Krab, Dutchman’s Inn, and others. There are characters from the show, including Patrick the Starfish, Squidward, and Mr. Krab himself. Even the customers look familiar as they are from the ‘extras’ in the cartoon. This really is a fun little economy game for the SpongeBob fan. When I was younger, I remember playing economy games where we would sell lemonade or apples. It really helped me understand how business works. If you have a youngn’ or if you’re a youngn’ at heart, then I recommend this game. Build up your Kraby Patty Empire and bring in the booty for Mr. Krabs!